Yesterday, when I took a walk in Central Park, my walking companion, M Cohen, pointed out to me (from the vantage point of Bow Bridge), that there was an area in the lake, which was not frozen, even though the rest of the lake was covered with ice. 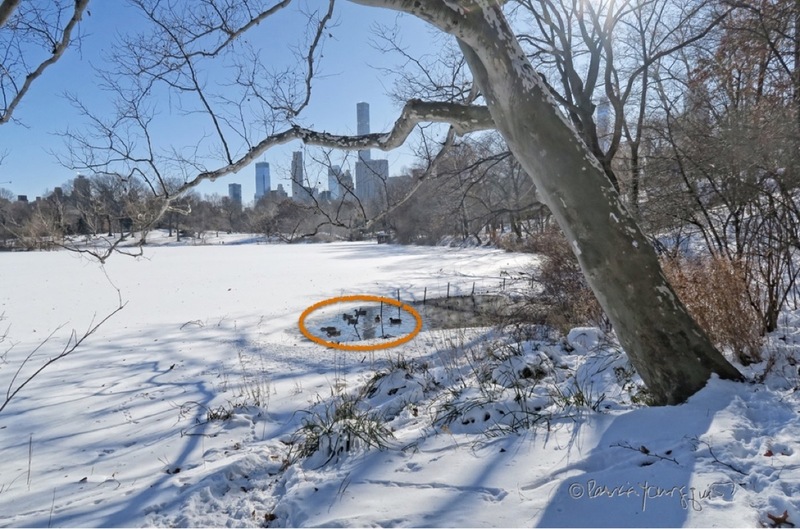 This is evidenced in the photographs atop this entry, where I've affixed an orange circle to every other image to indicate this. In any event, M Cohen thought that the Parks Department might have put something in that area of the lake in order to accommodate the Canadian geese and Mallard ducks, who spend time there. I have never heard of the Central Park's staff doing such a thing, and if they did, wouldn't Holden Caulfield, the protagonist in J.D. 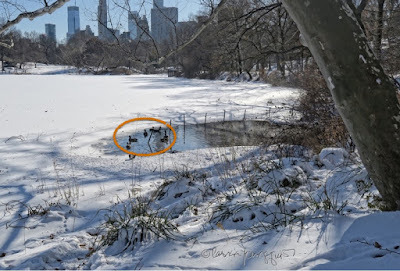 Salinger's novel, The Catcher in the Rye, have given this answer to Horowitz, when the question came up about what the ducks (who spend their days in Central Park) do during the winter?